Ah yes, a classic experiment done by Edward Diener at the University of Illinois Urbana-Champaign and his colleagues way back in the 1970s 1 Little did they know it, but Diener and his colleagues laid the foundation for understanding, at least in part, why all those smacktards on Xbox Live keep calling you a “gaytard,” whatever that means. And they did it with candy –delicious, 1970s candy. Diener et al. were interested in what situational factors lead children to engage in antisocial behavior, specifically stealing and breaking rules. So in a clever little quasi-experimental study they had researchers in Seattle, Washington turn 1,352 Halloween trick-or-treaters into unwitting subjects. 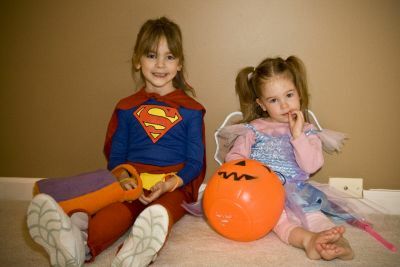 They set up several houses’ entryways with two bowls –one with fun-sized candies and another with money. When children came up to the door, the experimenter would greet them and tell them to take ONE candy from the bowl. They would then say they had to attend to something out of sight in another room, but would actually go behind a fake wall and spy on the children through a peep hole2 to see how much candy and/or money they took. Under the right conditions, these adorable trick-or-treaters will cuss you out for five minutes on Xbox Live before disconnecting. That was the general setup, but experimenters at different households also introduced what your Research Methods 101 textbook would call “manipulations” because of how they manipulated or changed one of the factors of interest to the researchers. For the anonymity manipulation, some kids were asked their names and address while others were not. For the altered responsibility manipulation, the researcher would sometimes single out one kid –the youngest– and state that THAT tyke would be responsible if anyone took too much candy or stole any of the money. The results were pretty stark. The kids who stole the least were those who came to the door alone (that is, not part of a group) and who were robbed of their anonymity by being asked their name and address. They only engaged in antisocial behavior 7.5% of the time. In contrast, simply being in a group –even when everyone provided identifying information– almost TRIPLED the transgression rate to 20.8%. But behavior was even worse for those costumed kids who believed the researcher didn’t know who they were. Even when alone, 21.4% of those anonymous kids stole, and when in a group that figure more than doubled to 57.7%. But you guys, wait, that’s not the worst of it. The absolute worst offenders were those groups of kids that were anonymous AND for which the experimenter had singled out one kid and said “I will hold you responsible if any extra candies are missing.” In those groups, the transgression rate was 80% –EIGHTY PERCENT! The researchers hypothesized that the reason for these increases in antisocial behavior had to do with “deindividuation,” which is when a person is made to lose a sense of individual identity. Remaining anonymous does this, as does being in a group and having a scape goat on whom to pin responsibility for your behavior. Normal Person + Anonymity + Audience = Total Fuckwad. How can players and game designers counter this? Well, from the player’s perspective, playing only with people on your friends list obviously eliminates the anonymity factor. If you find someone you like playing with, add him/her to your friend’s list. Or organize games in online communities where anonymity is reduced, like social networking sites or message boards. This is one reason why I think a lot of gamers ground their teeth when Infinity Ward limited the use of party chat in Modern Warfare 2. Developers and the architects of matchmaking systems can help by making it easier to get extra information about a person and follow up with him/her after the game. Or even better, create tools for players to get together and share personally identifiable information (even something as basic as real name and location, which any message board could do now) so that they can more easily find and form their own groups. Heck, at the extreme end I kind of like the idea of making everyone use their real name in their gamer tags or handles, though that way is fraught with issues related to the privacy of children’s information. Making it as easy as possible to do things like file complaints and player reviews also helps make people feel more accountable for their behavior. 3 Muting and booting systems, if employed by more mature players, also seem like they would lower the likelihood of people modeling the behavior of others and transferring the responsibility of fouling up the group’s behavior. So there you have it: the missing link between smacktards and Halloween. Just be glad that they can’t reach through Xbox Live and steal your candy. 1. Diener, E., Fraser, S., Beaman, A., & Kelem, R. (1976). Effects of Deindividuation Variables on Stealing Among Halloween Trick-or-Treaters. Journal of Personality and Social Psychology, 33, 178-183. 2. That feels …strange to write. 3. Though, ironically, I wonder if low feedback ratings that travel with a player from game to game might have the same effect as did the transferal of responsibility to one child in the Halloween candy experiment above; somebody test that! Thanks for the post! What’s really strange is that I haven’t heard a study on deindividuation and online video game play, yet. Or that I’m fishing on the wrong stream. Yeah, it seems like a totally obvious thing to study, too. does it have to do anything with age?i mean do younger people tend to act more unreasonable in these situations? I believe so, but that doesn’t mean that adults don’t do similar things. There’s research out there showing that people lie/cheat more when they’re part of a group or anonymous. And people can practically be made to claim that black is white and up is down if enough other people in a group make the claim first. As a partial solution how about some sort of reputation network, where you can rate players based on the quality of your experience with them? You could do all sorts of clever data mining, too — segregating players into like-minded groups who enjoy having the same kinds of multiplayer experiences. Done right, it ought to be possible to instill responsibility without sacrificing anonymity. Or at least crowdsource the identification of ‘total fuckwads’. I agree, but isn’t that basically how the player rating on Xbox Live works? Even so, I agree that it needs more to it. I only ever see people with 5 stars on there and I’d like the ability to limit the number of ANY players under 3 stars or X number of complaints, not just ones I’ve filed complaints against. There’s been piles written on it from within the MMO community, but under the term “disinhibition” and not “deindividuation.” Also google for pseudonymity. One thing that both annoyed and fascinated me when I played WoW was a response from one of the Blizzard moderators to a complaint I had about the limited length of the ignore list (at that time 25 players). The “Blue” (I think it might have been Vaneras) told me that the limit was there to protect people from having to endure lengthy consequences for anti-social behaviour or words to that effect. Very interesting design choice, isn’t it? Cool, thanks, I’ll take a look. Hah, wow. That’s serving their userbase, I guess. I find myself doubtful whether a mechanized reputation rating will work. Does a rating done by a machine mean you aren’t anonymous? And can it be hacked or manipulated? The other thing that comes to mind is that we aren’t really anonymous in online games, except by making new toons. There are those players who become notorious on a server for their antics, and they eventually become shunned. But this is a long term effect, and of course, doesn’t apply to situations where no one is truly watching. I’ve seen a few players become increasingly isolated socially because of their behavior, and while I wasn’t going to be the one to say “come and take advantage of me”, it seemed kind of sad. I know one guy that created alts to try to get into people’s guilds, because his main had such a bad reputation. Fortunately, we know of a way to find out what other toons are on the same account, and didn’t let him into our guild. Pingback: Anonymity and Antisocial Behavior | think about it! This article was very useful! Pingback: Are You Wrong About Video Game Violence?